More than 130 brewers, over 400 beers, and -20 temperatures collided at the Beer Dabbler’s 5th Annual Winter Carnival on Saturday, January 25, 2014 in St. Paul, Minnesota. Despite the temperatures, tickets sold out with 10,000 people in anticipated attendance. The weather did not seem to put a damper on attendance or people’s enthusiastic drinking spirit. I had the opportunity to meet Jenn Schaal of Growler Magazine, one of only six organizers that put this fest together, who confirmed this was the largest crowd and by far coldest weather the young winter carnival had ever seen. 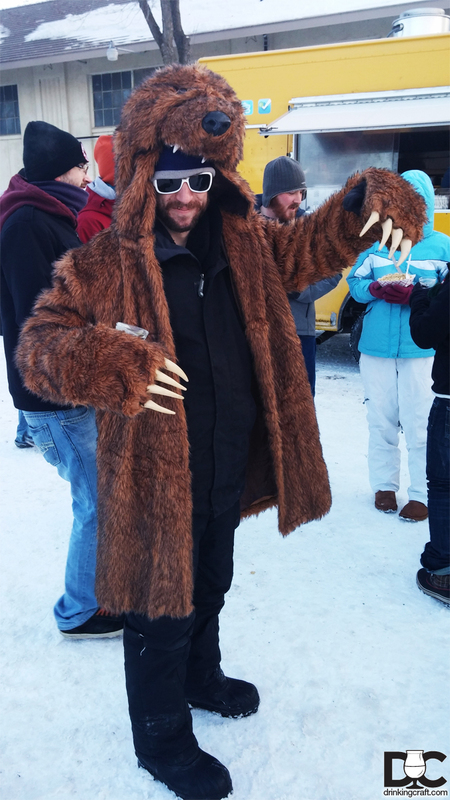 Despite the coldest ever temperatures for the Beer Dabbler, the Minnesotans arrived in full force to get their drink on. It was pretty exciting to see the crowd gathering at the gate even though my toes were already frozen. Once the gates opened, the crowd flooded in, and the canon sounded, it was time for beer dabblin’! 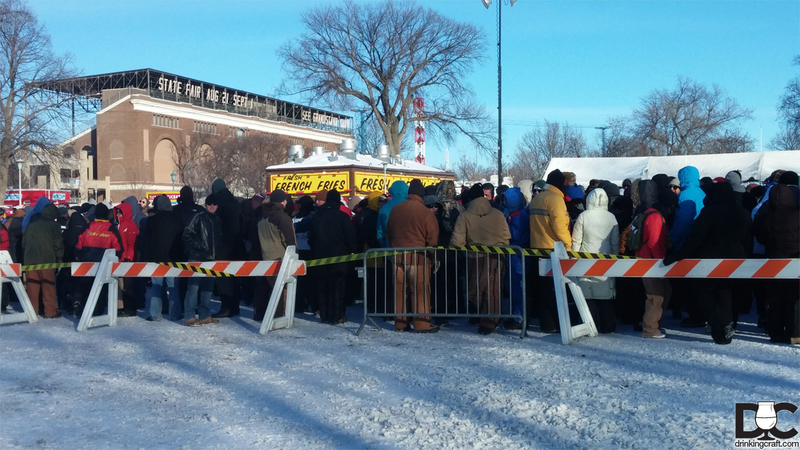 The crowd gathers in twenty below temps to get their Dabble on! 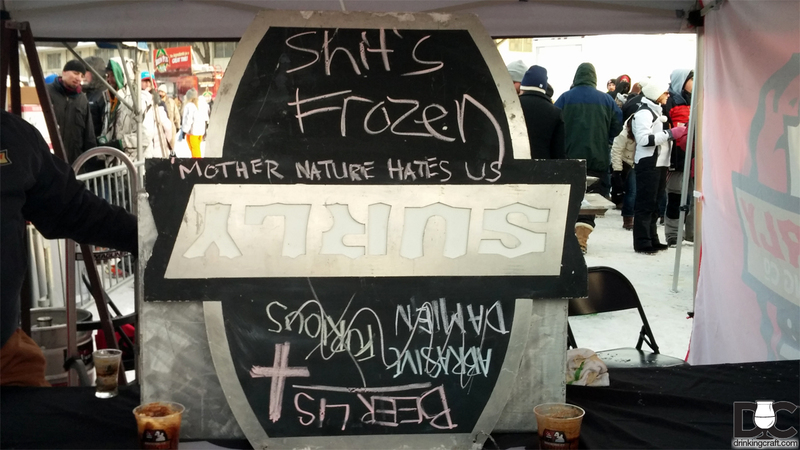 However, the sub-zero temps did put a damper on some of the vendors’ spirits. Starting as early as 2:30pm coolers, tappers, kegs and tubing were shuttled in and out of the warming tent to try to unfreeze lines, in order to serve beer. Many vendors were unable to get beer going and as the evening wore on, some, such as Surly, were not able to share any of their beers at all. Frozen lines let to limited selection, which led to long lines at tents where beer was able to be served. The vendors that had the most success were those that brought bottles instead of kegs. Despite all this people genuinely seemed to be having a great time, some seemed to have a very great time, and much beer was sampled. I did hear some complaints of there not being enough glasses as well, to which Schaal answered that the volunteers and staff did everything they could, even giving away their own tasting glasses, to make sure paying ticket-holders were able to sample beers in their commemorative glass. 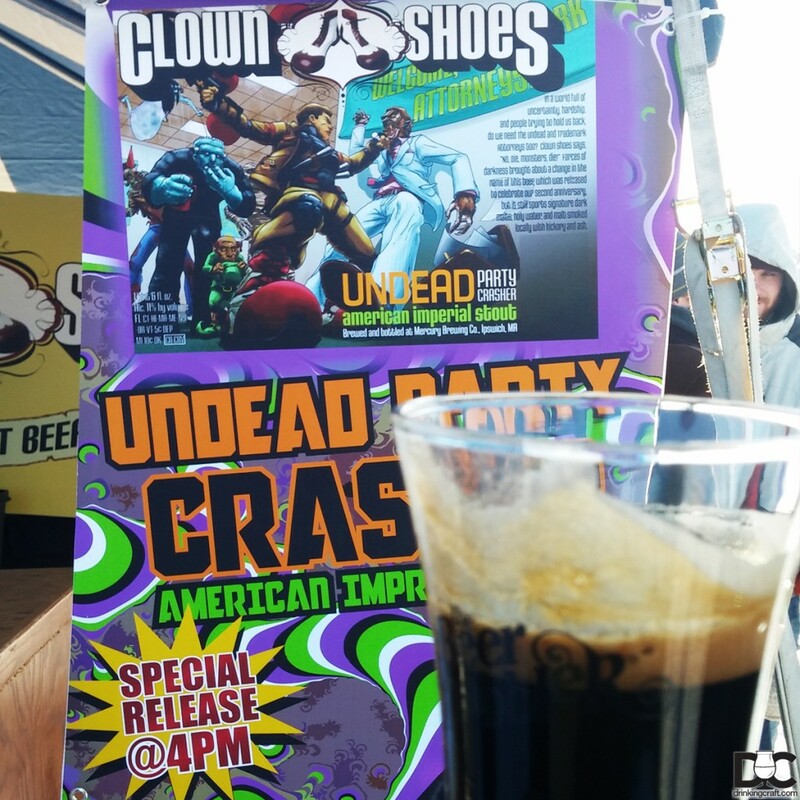 Now onto some highlights of the festival…my personal favorite taste was Clown Shoes’ Undead Party Crasher. An American Imperial Stout, it had rich notes of chocolate and coffee. I bet in a warmer setting, it would be even better. The Beer Dabbler was the first time Clown Shoes tapped this beer for public consumption and I was lucky enough to be the first Dabbler attendee to try it. Another brewery that stood out was Dangerous Man Brewing, which had a milk stout that tasted like malted milk balls. I’m not often a huge fan of milk stouts, but this one is done exceptionally well and I would go back up to St. Paul for a visit to their tap room. These guys were still out pouring at 7:00pm when most other vendors had packed up and headed home due to the cold. Perhaps it was the dedication to celebrating their 1st anniversary with beer aficionados at the Beer Dabbler or maybe they just drank a lot of their own delicious beer, but their dedication to getting their brews out was commendable. Probably one of the most unique parts of this event was the opportunity to try and set a Guinness World Record Snowball fight. 7,000 participants were required to beat the current record holder, but I’m sad to say the Arctic-like weather forced a lot of would-be participants to leave the festival earlier, before it got darker and much colder. Post-festival I reached out to Jenn to get an estimate on the numbers for the snowball fight. “As for the snowball fight, we’re still tabulating the results – but we guess about 2,000 people made it to the snowball fight, although auditors are still counting and verifying numbers of registered wristbands. 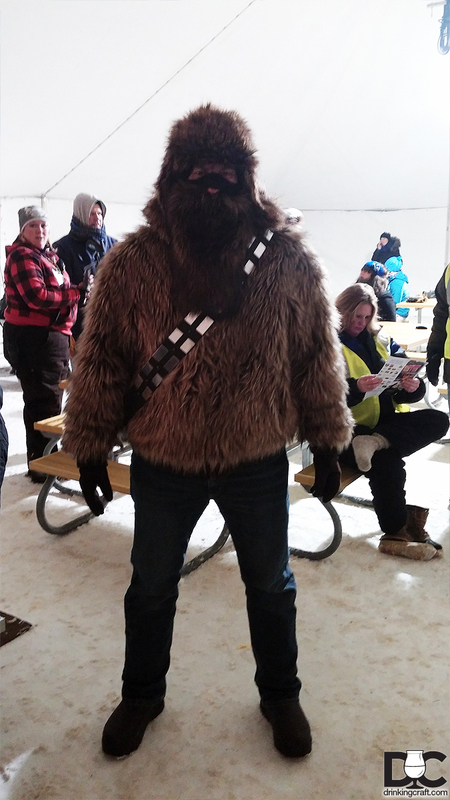 Although the fight was unsuccessful, the fact that thousands showed up for the festival in below-zero temperatures and wind chills is remarkable! In fact, the entire day was a very interesting example of Minnesota heartiness,” Jenn stated.